A daily wear synthetic diamond pendant necklace in feminine bow shape. Available in 16", 18" or 20" chain lengths. Available options: platinum, 14k or 18k gold: white, yellow, rose. 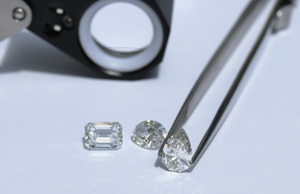 Ada Diamonds brightens the world with compelling and sustainable conflict-free diamonds. As seen in Fortune, Forbes, CNBC, Wall Street Journal and more. Ada Diamonds Design Description- A playful and delicate pendant necklace featuring conflict-free round brilliant lab diamonds arranged in a bow shape in 14k white, yellow or rose gold on a 16", 18" or 20" chain.